Over the last 8 games (thru Roark’s game last night) the Nats starters have a collective ERA of 1.09. Over the 7 games including Fister’s last start they had struck out 50 batters with NO WALKS. That has not been equalled since 1914! And I’ve been noticing how Fister’s intensity has rubbed off on the other pitchers. This was very obvious in how Roark played last night. 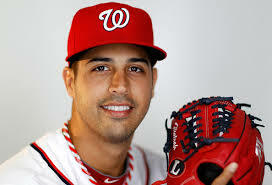 All of the above has me concerned for Gio Gonzalez’s sake. A look at the pitching stats will show you why. His ERA is closer to 5 than 4, while the collective ERA of the other starters is under 3.00! And I’m sure Gio (and Steve McCatty) is very aware of this startling fact. I hate to even mention this because that is bad karma in the world of baseball. Like Stephen Strassburg, Gio doesn’t handle pressure very well, and that puts them apart from the other starters. Lets hope this doesn’t lead to problems once Gio gets back into the rotation. ← Don’t Gimme no Stinkin Walks!